I’d like to challenge you all to do one simple thing next week. Put your runners on and walk. Walk in the shoes of women around the world who walk for hours every day to collect water, food and firewood for their families. Put yourself in their shoes and get out and about for your own good too. Not only will it help your work-life balance, get you outside in the fresh air and improve your fitness; at the same time you’ll be helping less fortunate women and girls around the world to improve their work-life balance too. 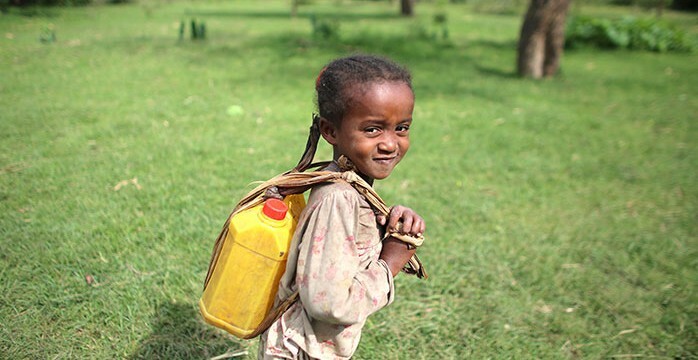 Women and girls in developing countries walk an average of 6km every day to fulfil household chores. Hours spent walking mean women often miss out on earning an income or contributing in their communities and girls don’t go to school. Whole communities are being held back as women and girls don’t have the chance to fulfil their potential. Join me in taking part in CARE Australia’s Walk in Her Shoes challenge from 8-14 March (or if that doesn’t work with your schedule, choose your own seven days) and help other women and girls step out of poverty. It couldn’t be easier. You choose your own level of challenge – walk (or skip or run!) 25, 50 or 100km when you can over the course of a week and ask your friends and family to support your efforts and donate to CARE Australia. There are simple ways to rack up your steps whilst also improving your energy at work. Walk to work or at least part of the way rather than driving or catching the train or bus. Get out and walk through your lunchbreak. Take a walking meeting – get out of those stuffy meeting rooms and walk around the block instead. Chances are it will probably be a more productive meeting. And why not challenge your team-mates, boss or clients to step up too and get a bit of healthy competition going in the office. I’m encouraging all of my teams to take part and join the thousands of Australians who want to help women in developing countries to earn a living and girls to continue their education. I have personally visited a number of CARE’s programs and it is an extraordinary organisation that is making a real difference. They are not about giving food or handouts, they are about giving people the knowledge and skills they need to help themselves out of poverty. CARE helps women who then help their villages – research shoes that when one woman escapes poverty, she’ll bring four other people with her. Many of CARE’s projects help reduce the distance women and girls have to walk by providing clean water and nutritious food close to home. This means girls can spend more time in school, women can earn an income and together they can help their communities step out of poverty.